N80946 at a gloomy, damp Shannon - EINN, Ireland. C-FFSU at Vancouver - CYVR, British Columbia. N9895B at Vancouver - CYVR, British Columbia. N9895B with TYEE at Ketchikan, Alaska. First day ops with completed titles. • 55-3324 United States Army. Delivered 04-Jan-1957. Designated as U-1A. May-1957. Collected by crew and flown to 202nd Aviation Company, Boscomantico AAF., Verona, Italy, part of Southern European Task Force, SETAF. Jan-1963. Headquarters Company, 3rd Support Command, Gibbs Barracks, Frankfurt, Germany. Dec-1966.394th Transportation Battalion. Nelligan, Germany. Sep-1969. 29th Transportation Company, Stuttgart, Germany. Nov-1970. 56th Aviation Detachment, Mannheim until Aug-1971. Aug-1971. Coleman Barracks, Mannheim and put up for disposal by tender in Dec-1971. • N80946 Ferrer Aviation Inc., Miami. Circa Feb-1972. Note:. Ferried to St Jean, QC., where it was converted to civilian configuration by St. Louis Aviation. • CF-FSU Northland Fisheries Ltd., Winnipeg, MB. Regd 01-Dec-1972. • CF-FSU Labrador Airways Ltd., Goose Bay, NL. Regd 14-Dec-1972 to whom it was registered as. • C-FFSU Labrador Airways Ltd., Goose Bay, NL. Re regd on 17-Jan-1973. Accident: Lac Squaw, Schefferville, Québec 04-Sep-1979 The aircraft collided with a Cessna 180 after confusion over landing intentions caused the Otter to land on top of the Cessna. The Otter continued another two hundred feet before touching down and as it did it overturned and sank because the left float and strut collapsed. Five of the eight people aboard the Otter perished in the crash. • C-FFSU St. Louis Aviation, St Jean, QC., to where it was trucked and repaired. Dates unknown. • C-FFSU Hyack Air Ltd., New Westminster, BC. Regd 28-Apr-1981. • N9895B Tyee Airlines Inc., Ketchikan, AK. Regd 25-Aug-1981. • N9895B Temsco Helicopters Inc., trading as Temsco Airlines. Ketchikan, AK Regd Mar-1985. • N9895B Taquan Air Inc., (Scudero Inc.) Ketchikan, AK. Regd 20July 1994. Canx date unknown. • C-GDOB Denis O'Brien, the owner of the company Buffalo Narrows Airways Ltd., Buffalo Narrows, SK. Regd 30-Apr-1996. Accident: Thirty miles east of Terrace, BC in the Telkwa Pass. 09-May-1996 The aircraft had struck mountainous terrain and was destroyed. Both occupants. Dennis O’Brien and a colleague had been fatally injured. Otter 194 was delivered to the United States Army on 4th January 1957 with serial 55-3324 (tail number 53324) and first served with the 202nd Aviation Company, Boscomantico AAF, Italy, part of SETAF. 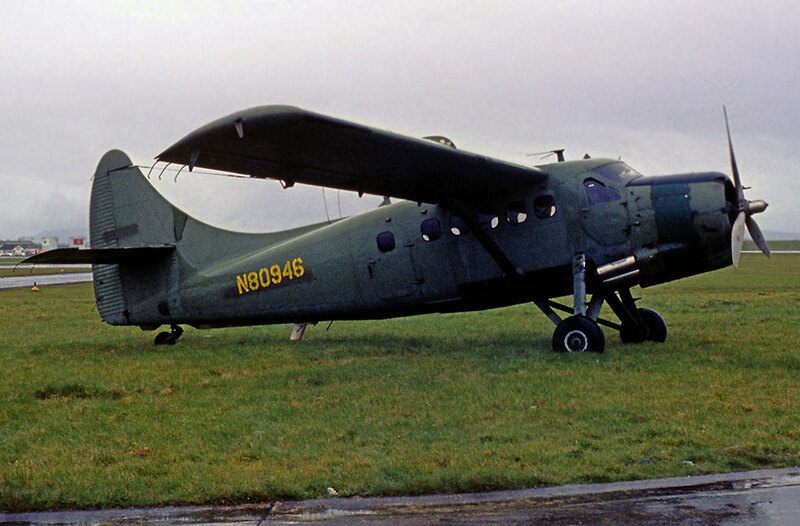 It was one of five Otters (the others were 53323, 53325, 53326 and 53327) delivered from Downsview to Red Bird Field, Dallas, Texas where they were fitted with radios suitable for use in Europe. The five Otters were then flown to Mobile, Alabama and put on board ship, sailing to Bremerhaven, Germany. Here the Otters were re-assembled and flown to the depot at Coleman Barracks, Mannheim, Germany, from where they were picked up by pilots of the 202nd Aviation Company and flown to their new base in Italy in May 1957. It continued to serve with the 202nd Aviation Company until January 1963. 53324 was then assigned to the Headquarters Company, 3rd Support Command and then in December 1966 to the 394th Transportation Battalion. It joined the 29th Transportation Company at Stuttgart in September 1969, then being assigned to the 56th Aviation Detachment at Mannheim in November 1970 where it continued to serve until August 1971. After spending its entire military career based in Europe, it was then stored at Coleman Barracks, Mannheim, Germany and was one of eight Otters stored there which were put up for disposal by tender in December 1971. As explained in relation to Otter 137, all eight Otters were purchased by Ferrer Aviation Inc. of Miami for a total price of $303,640, of which $33,800 was the price for 53324, which at that stage of its career had 3,817 hours on the airframe. On 2nd February 1972 civilian registrations were applied for from the FAA and 53324 was allocated N80946. It was ferried from Coleman Barracks via Saarbrucken, Germany to Ashford in Kent and on to Shannon, Ireland where it arrived on 15th March 1972. At Shannon, ferry tanks were installed by SRS Aviation and on 13th April 1972 in company with Otter N80944 (ex 53293), the two aircraft set off for the long transatlantic crossing, first stop Reykjavik, Iceland and then onwards via Greenland and Newfoundland. N80946 was flown to St. Jean Airfield, a repair shop which specialised in Otters. On completion of the work it was sold to Northland Fisheries Ltd., of Winnipeg, registered CF-FSU on 1st December 1972. It was sold on almost immediately, on 14th December 1972 to Labrador Airways Ltd., to whom it was registered as C-FFSU on 17th January 1973 and flown to its new base at Goose Bay, Labrador. 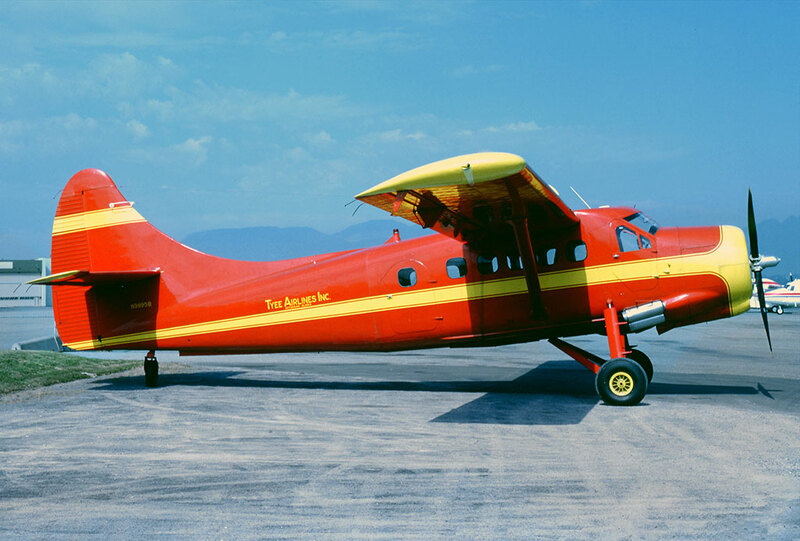 The Otter was to fly for Labrador Airways for nearly seven years. An incident was recorded on 16th February 1976 when the Otter was landing at Lodge Bay on a mail flight from Mary's Harbour. FSU landed on snow-covered ice near the small community after circling to ensure that the marked landing area was free from obstruction. During the roll-out, a snow mobile drove out from the perimeter area into the path of the Otter. FSU wasn't damaged but the snow mobile operator was killed instantly by the propeller. On 4th September 1979 FSU was involved in a much more serious accident at Lac Squaw, Schefferville, Québec when it collided with Cessna 180 C-FHWR. The Otter had deployed to Schefferville to support the annual caribou hunt. FSU was on floats, as was the Cessna, and both were on converging courses towards the same seaplane base. The Cessna overtook and passed the Otter on the right and then crossed in front to establish a right hand circuit to the lake. The pilot of the Cessna had transmitted his landing intentions, which were interpreted by the Otter pilot to mean a bay in front of the company's base. Consequently, as the Cessna proceeded out of view to the left, the Otter pilot concentrated on his own approach to the lake. The Cessna however had turned to the right and was also making an approach to the same landing area - the two aircraft were again on converging courses. Some four to five seconds after the Cessna had landed, the left float of the Otter struck the Cessna's right wing and cowling. The Otter continued another two hundred feet before touching down and as it did it overturned and sank because the left float and strut collapsed. Five of the eight people aboard the Otter perished in the crash. The right wing and cowling of the Cessna were damaged, but the aircraft stayed afloat with no injuries to pilot or passengers. While on final approach, the pilot of the Cessna saw the Otter to the right and slightly behind him and assumed it was on an approach parallel to him. The pilot of the Otter did not see the Cessna at any time during the approach. This most unfortunate accident does emphasise the necessity of keeping an eagle eye out of the cockpit at all times, even in Canada's remote northlands. That accident ended the Otter's career with Labrador Airways. The wreck was sold by the insurers to St. Louis Aviation, who had refurbished the aircraft when it first arrived in Canada, and was trucked to their facility at St. Jean Airfield, Montreal where it was rebuilt. It was then sold to Hyack Air Ltd of New Westminster, BC to whom it was registered on 28th April 1981. It was noted at Pitt Meadows, BC on 10th May 1981 in full Hyack Air colour scheme, except for titles, and about to enter service. Hyack Air were based at New Westminster, where they had a float base dock on the Fraser River. Pitt Meadows was an airfield on the Fraser River some ten miles away where Hyack Air aircraft were maintained. 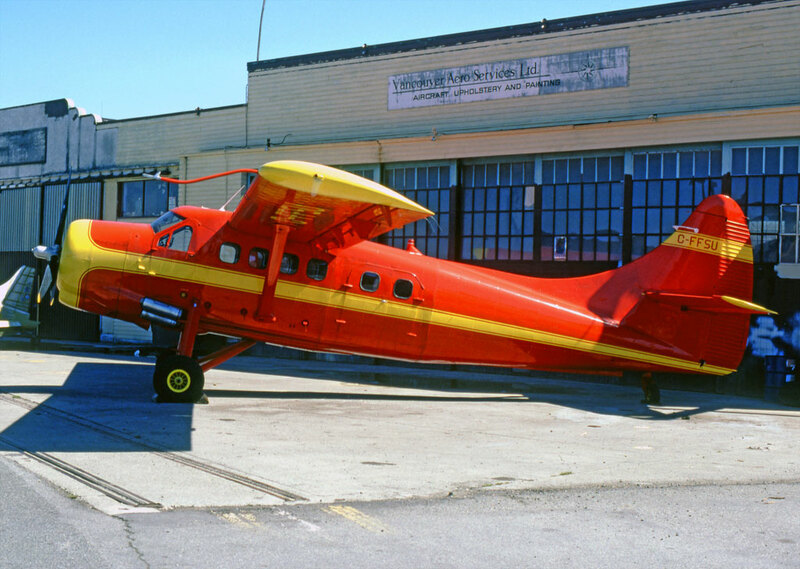 With Hyack Air, the Otter was used for charter work along the Pacific Coast. 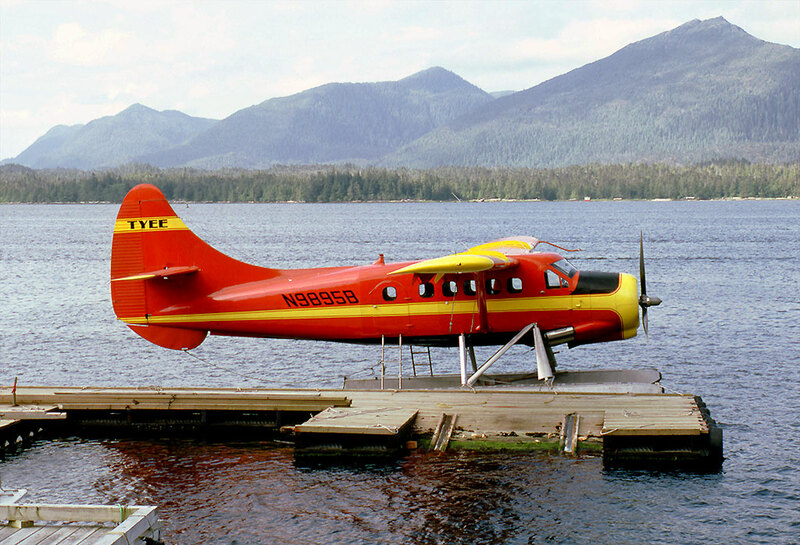 Having flown for Hyack Air for the summer of 1981, the Otter was sold for $145,000 to Tyee Airlines Inc. of Ketchikan, Alaska and registered to them on 25th August 1981 as N9895B. It was noted at Vancouver on 13th September 1981 having been painted in Tyee colours by Vancouver Aero Services Ltd., carrying marks N9895B and about to depart on delivery to Ketchikan. It was to fly out of Ketchikan for the next fifteen years. In March 1985 it passed to Temsco Helicopters Inc., trading as Temsco Airlines, and in July 1994 to Taquan Air, all the while flying passenger schedules and charters out of Ketchikan. In April 1996 the Otter was sold to Buffalo Narrows Airways Ltd., of Buffalo Narrows, Saskatchewan and was registered to its new owners as C-GDOB on 30th April 1996. The 'DOB' of the registration stood for Denis O'Brien, the owner of the company, which already flew Otter C-GBNA (125). The Otter had been completely rebuilt by Taquan Air and performed a one-hour test flight before it departed Ketchikan at 09:05 hours on 9th May 1996 on its delivery flight to its new owners, with Denis O'Brien himself as pilot and with a co-pilot. The cargo on board the Otter on take-off from Ketchikan included all the known technical records for the aircraft, and spare parts for the floats and landing gear assemblies. As well there were eleven five-gallon plastic gasoline containers. After a refueling stop and weather briefing at Prince Rupert, where it also cleared Canadian customs, the Otter departed eastbound along the published Telkwa Pass VFR route through the mountains en route to Dawson Creek, BC where it was to make another refueling stop before continuing on to Buffalo Narrows. When the aircraft did not arrive at Dawson Creek it was reported overdue. The next day, an extensive search for the missing Otter commenced and wreckage was located by search and rescue aircraft at 19:30 hours, thirty miles east of Terrace, BC in the Telkwa Pass. C-GDOB had struck mountainous terrain and was destroyed. Both occupants had been fatally injured. At Prince Rupert, the flight service station (FSS) specialist had provided the pilot with a comprehensive weather briefing, covering both the Skeena River and Telkwa Pass published VFR routes through the mountains. Although the weather forecast called for VMC conditions on both routes, the specialist recommended the pilot take the Skeena River route so that he could use lower en route altitudes if he encountered adverse weather. The pilot however had expressed his preference to fly the Telkwa Pass because it was significantly shorter. Reduced visibility in snow showers was forecast. The ceiling in the pass was reported to be 6,500 feet above sea level, 3,500 feet above ground level at the highest point in the pass. Visibility was reduced occasionally to ten miles in light snow showers. The Otter had departed the Seal Cove seaplane base at Prince Rupert at 13:07 hours and the pilot reported to the Terrace FSS at 14:16 that he was ten miles south of Terrace at an altitude of 4,500 feet. The FSS specialist had advised the pilot that the current Smithers weather, thirty miles further east along the flight-planned route was - estimated broken ceiling at 6,500 feet, visibility 25 miles, temperature 6C, dew point -8C, wind 120 degrees magnetic at seven knots, altimeter setting 30.27 inches of mercury, nine-tenths towering cumulus cloud coverage and virga and rain showers in all quadrants. At 14:29 hours the pilot reported his position to the Terrace FSS as fifteen miles east of Terrace. He advised that they were encountering light snow showers. No other radio communication from the flight was received. An ELT signal from the aircraft was later received by the SARSAT. Aerial reconnaissance did not establish the initial point of impact. However, the engine was located at the seven-thousand-foot level, snagged in a rock outcropping on a sixty-degree slope. It had apparently fallen down the steep terrain from a higher elevation. Other pieces of wreckage, including two floats, part of a wing, other small aircraft pieces and the plastic fuel containers, were located further down an avalanche slide area. Most of the wreckage was not visible, likely because it had been buried in snow or loose rock. The bodies of the pilot and co-pilot were found at about four thousand feet, at the base of the slide area. The accident site was considered extremely hazardous because of the risk of avalanche or rock slide and a ground examination of the limited wreckage was therefore not undertaken by the accident investigators. However, a limited aerial examination was conducted. The accident site was overflown several times during the summer after the snow had melted, but no additional wreckage was discernible. The investigators concluded that deteriorating weather had affected the pilot's ability to maintain visual contact with the terrain. The Canadian Armed Forces were heavily involved in the search. As their report summarises: “RCC Victoria was alerted by a concerned citizen, the brother of the pilot of the overdue Otter flying VFR from Prince Rupert to Dawson Creek. An electronic search was carried out with negative results. Numerous search aircraft were tasked from 442 Squadron, Comox, one from Cold Lake and one from Winnipeg to participate in the search. The initial search was carried out over the VFR routes from Terrace to Dawson Creek with negative results. The search master HQ was set up in Terrace. The aircraft was located crashed into a mountain thirty nautical miles east of Terrace”. Weather at the time of the accident was very bad, with towering cumulus cloud, isolated cumulo nimbus topped at 20,000 feet, thunder storms with rain, snow and hail, icing and ceilings of 300 to 600 feet above ground level. The CAF report concluded that the accident was “weather related”. CAF aircraft taking part in the search were four CC-115 Buffalos from 442 Squadron, Comox (115451, '452, '456 and '465), two Labrador helicopters also from 442 Squadron (11310 and 11316); CH-146 Griffon 146416 from Cold Lake (transit time 12:54 hours, on-scene time 1:30) and CC-130 Hercules 130332 from Winnipeg (transit time 6:54 hours, on-scene time 5:18 hours).